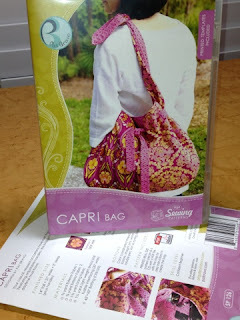 I've taken the last few days to use some of the products that I was invited to evaluate at Sew Expo. I will be sure to post updates if I discover anything else after using them for a longer period of time. Just in case anybody is wondering, I was not paid to write reviews on these products. For better or for worse, these are my honest opinions. As with just about anything, your mileage may vary. These things are pretty cool. If you've ever spent time hunting for that one spool of thread that matches your bobbin, you will love this. 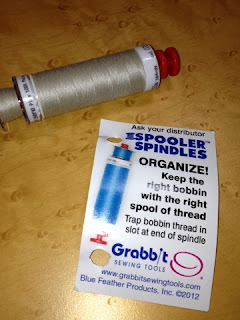 The Spooler Spindle really takes the guesswork out of trying to figure out if that bobbin has blue thread or black. It is also great for taking to class. I did notice that the Pfaff type J bobbins (used in machines such as the Creative Sensation, Creative Performance, Quilt Expression) will work not with the Spooler Spindles. They have a smaller hole on top than on bottom. I tested the Spooler Spindles successfully on Brother/Baby Lock 15J bobbins and Bernina CB hook bobbins. For the photo, I used a Brother/Baby Lock bobbin. So, would I buy more of these? Yes. I do love my magnetic pincushion, so I was very excited to test a wristband style one. It has a very powerful magnet, so the pins do not easily shake loose. With how it is designed, the pins also go on straight. They do not stick out of the sides. It makes using the Wrist Grabbit less of a bloodletting event because you can quickly and painlessly pick up a pin from its side. I did not even once say ouch while using this which is quite shocking for my accident prone self. The wristband is very adjustable too. I don't have the most dainty of wrists and I had no problems with the size. I also asked my husband to try it on for size. Like me, he had no problems with the length of the band. While this has a lot going for it, I didn't find it to be as comfortable as I'd like. I don't blame the device, I think it is how I use it. As a left handed person, I have a tendency to experience some things slightly differently. When I tried the Wrist Grabbit on my right wrist, I found that it was more comfortable. Unfortunately, I am not going to remove my watch (I wear a watch on my right wrist) to use it. So, would I buy more of these? Maybe. For me as a lefty, no. If I wasn't left handed (or if I didn't wear a watch on my right hand), yes. 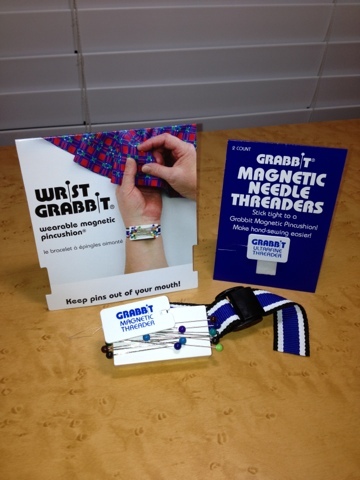 Another great product from Grabbit. Two threaders are included in the package - one for small eyed needles and one for regular needles. Both of these have a larger, sturdier tab for holding the threader that some of the other threaders I've tried. The Magnetic Needle Threaders are easy to store because you can keep them on your Wrist Grabbit or other magnetic pincushion. I had a harder time with this than some of the other products I tested. It is washable and the package lists a variety of uses. It isn't just a steam pressing cloth. It can be used as a dust cloth too. Do I like it as a steam pressing cloth? No, not really. While it does seem to perform as promised, I do not like that I can't see what I am pressing underneath it. If it was translucent, I would like it a lot more. 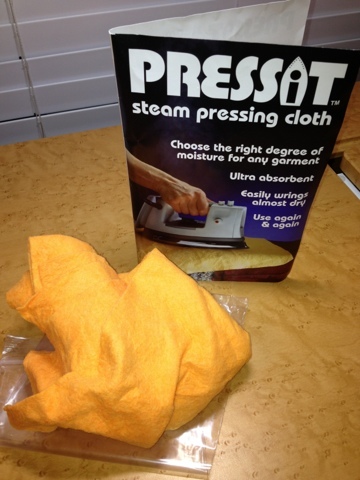 If you are OK with not seeing what is underneath it, the Pressit Steam Pressing Cloth might be the tool for you. I love SCHMETZ Needles. I have a variety of sizes and types of their needles already, so this was a great fit for me. One of my favorite things about SCHMETZ needles is the color coding. As an example, quilting needles have a green band at the top, microtex (aka sharps) has purple, embroidery has red, and jeans (aka denim) needles has blue. This makes them significantly easier to tell apart. The SCHMETZ Gift Box that I received has 4 packages of needles (Quilting 75/11, Quilting 90/14, Microtex 70/10, and Topstitch 90/14), a sample spool of Sulky's PolyLite thread, and the SCHMETZ ABC Pocket Guide all thoughtfully packaged in a reusable tin with a clear front. If you are looking for a gift for a sewist, this would be a nice option. The Gift Box also comes in other "flavors" such as heirloom, embroidery, and universal. I think the ABC Pocket Guide is one of the best parts of the whole thing. It provides information on each type of needle including the available sizes, features of each needle, and suggested fabric types to be used with this kind of needle. 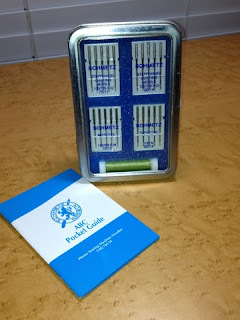 You will also find information on needle anatomy. Overall, this is an excellent reference guide. So, would I buy more of these? Yes, I sure would. The tins are great to store other things besides needles. I would certainly give one as a gift to another sewist. 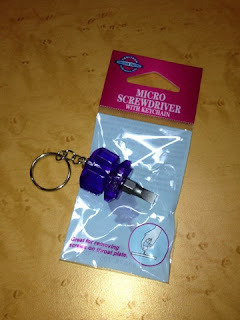 With a stubby handle, this little micro screwdriver is super handy. I was able to get a good grip on the handle and the small length makes it easy to get it under the arm of my machines. You can use it for unscrewing and replacing needles, removing needle plates, or changing feet. I don't think that I will be putting it on my keychain, but the keyring makes the Micro Screwdriver easy to keep track of. I can quickly locate it. If ToolTron asked me how they could make it better, my answer would only be to give it a clear, sparkly handle. I think Pellon's Perfect Loft is pretty close to perfect. It is a much fluffier fiber fill that is extremely soft. It looks a little bit like somebody shaved a poodle (in a good way). It doesn't have the hairy/stringy feel that some of the other fiber fills have. It is also marketed as being hypoallergenic. As somebody with fairly hideous allergies, I have not had an allergic reaction to it thus far. I'm sure many of you are familiar with other types of fiber fill, so I took a picture of the Perfect Loft next to the regular stuff. For the purpose of comparison, both samples are 2 grams in weight. The Pellon product does not flatten as much as the normal poly fill. So, would I buy more of these? Yes! Yes! Yes! This cute, functional bag pattern comes in PDF format on a disc packaged in a nice, DVD style case. One of the best parts of it is the included real size templates. This is a great touch that will be a big time saver and take away concerns about whether or not you taped the pieces together properly after you increased the size when printing the pattern. I'd love to say that I've had a chance to make this adorable bag, but I can't. Why not? Many of the Ultrabook computers don't have optical drives. Same thing goes for tablet devices like the iPad, Galaxy Tab, or Kindle Fire. So, you guessed it. I am using one of those devices. Art Gallery Fabrics also has some lovely fabrics. Not only are they attractive, they are made of Pima cotton which makes them ultra soft. 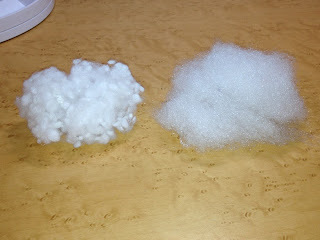 I regularly use only high quality quilting cotton, but this Pima cotton is even more soft and very smooth. So, would I buy more of these? Maybe. The patterns shown on their website are cute and functional, but the lack of downloadable instructions is a potential problem. Flowers, flowers everywhere. This book is well written with great instructions, diagrams, and photographs. 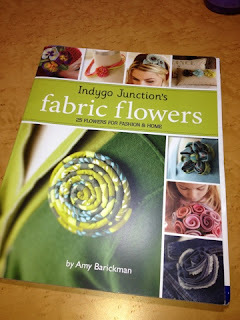 I had a chance to meet Amy at Sew Expo. She is incredibly nice, and she took a minute to even sign my book! So, would I buy more of these? Yes. I know a number of people that would love this book. Indygo Junction also has a lot of other books that I'm interested in too.